I don’t even KNOW how I can convey my love for these little honey-dripping jars. But I’m going to try. 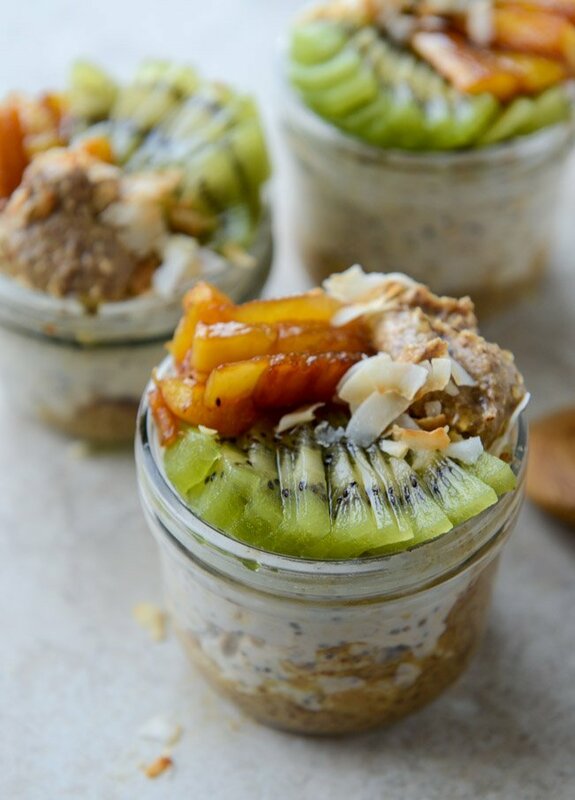 Because coconut overnight oats! What practically all breakfasts should taste like forever, unless you want bacon and eggs. They kind of look like the grown up version of sand art. Without the sand. And without the art. I’ve always enjoyed the concept of having a breakfast right there in the fridge first thing in the morning, the moment you wake up. One that isn’t a granola bar or even a banana, stuff like that. But I didn’t truly appreciate it until, well, right now. Right now as in: life with Max. Real life, I can’t even remember and/or would be slightly embarrassed to tell you some of the things I have grabbed out of desperation first thing in the morning over the last year. The problem is that I’ve ALWAYS been a breakfast person. I mean, I guess it’s an excellent problem to have. I’ve never been one to skip breakfast. So I know I need something, and with it being my favorite meal (though mostly my favorite at dinner… ), I WANT something. Choices have included but are not limited to a leftover scone that sat out overnight, an expired container of yogurt and a cookie (or four). That is, if I don’t want what Max usually eats, which is some scrambled eggs and fruit and cheerios or a yogurt pouch. Unexpired for him of course, lucky dude. 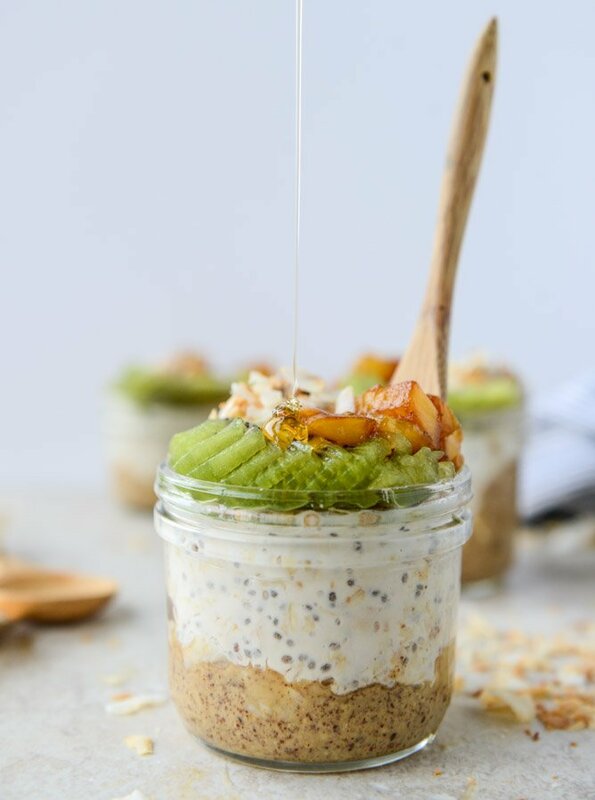 The worst part is that my instagram explore page is always flooded with the MOST incredible photos of breakfasts first thing in the morning – smoothie bowls galore, these layered parfait things, ten kinds of toast (that don’t include peanut butter or jelly) and huge oatmeal bowls. And I’m like whyyyyyyy can’t that be my kitchen. ASAP. And while my personal favorite at-home breakfast meal is avocado toast with eggs, I actually prefer to have it a lunch. After I’m sufficiently caffeinated. Breakfast quirks, let me hear you. 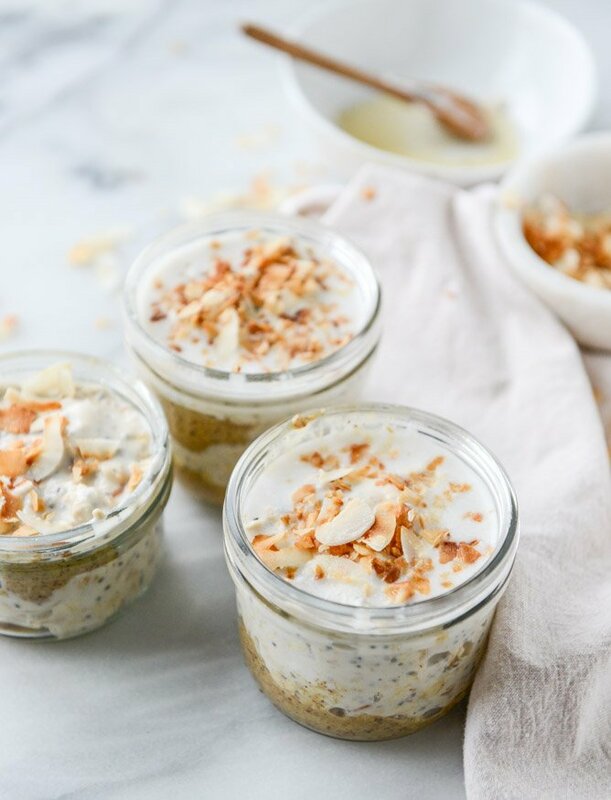 These adorable little jars are filled with coconut yogurt, coconut milk, toasted coconut and oats! A touch of honey too, along with some chia. It’s a coconut lover’s dream. It’s even really delicious if you don’t like the texture of coconut but adore the flavor. Like Eddie. Thank you coconut rum for teaching him the flavor is spot on perfect. No thank you to sweetened shredded coconut, which squeaks between teeth and turns half of the population off. I also layered in some vanilla almond butter (justin’s!) 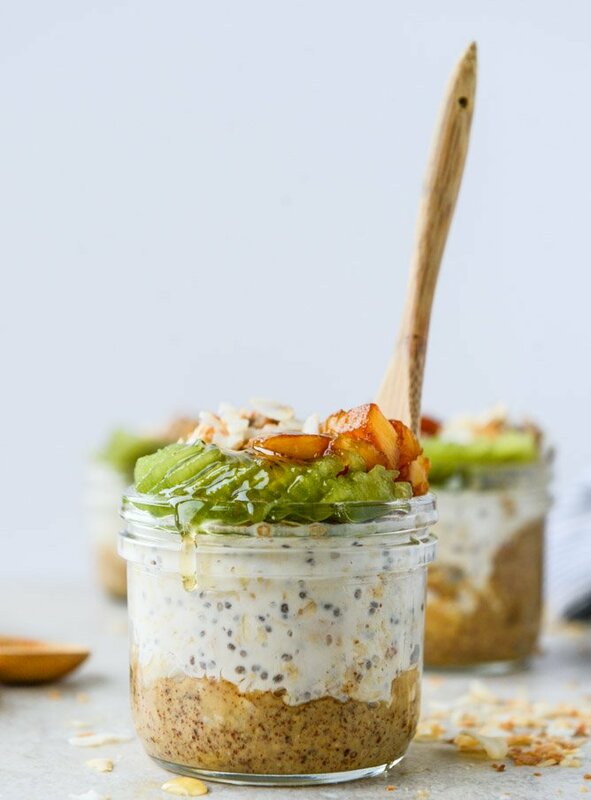 because I just kind of need something else with my overnight oats. Plus… vanilla almond butter. It’s so freaking wonderful. Also, as a note, sometimes I like to let mine sit at room temperature for awhile. I don’t love food at severe temperatures, be it hot or cold (except for ice cream, of course, since I know you’re wondering), so I’ll take it out of the fridge, make Max breakfast and then sit down to this situation. But let’s be real. I’m rarely sitting down. That is horrible but true. I’m scared of what it will look like with another kid or two. So scared that I rhyme. Ohhhh and to top it all off, and make it somewhat high maintenance after I just talked about really needing a breakfast that isn’t high maintenance at all ever, I caramelized some pineapple for the top. You totally don’t need to caramelize it, but it’s delish. 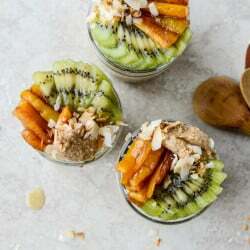 Or you can simply just cut up some pineapple and kiwi and go from there. It’s fantastic. That combo is life. Plus all the good feels. Breakfast is forever. Note: to toast the coconut, I simply place a 1/2 cup or so in a dry pan and set it over low heat. I cook, stirring often, until it is golden brown and fragrant. Don’t leave it unattended – it will burn! 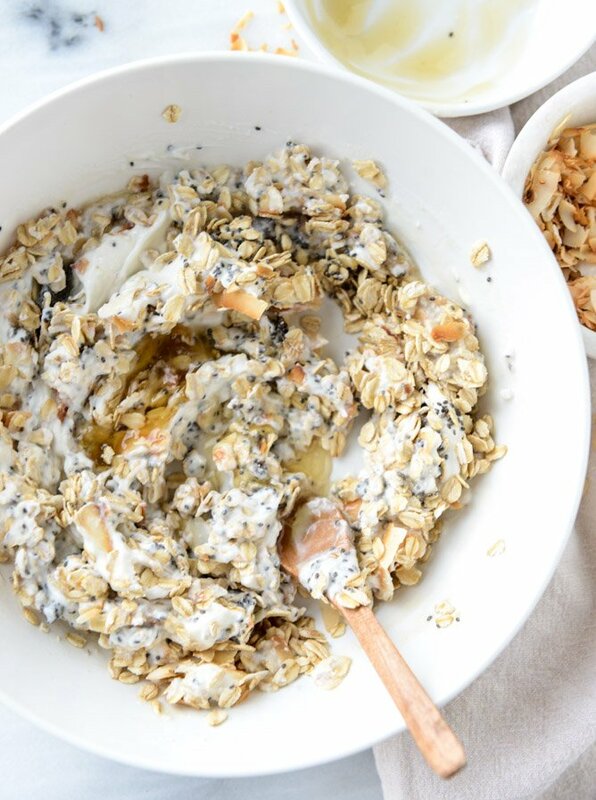 In a large bowl, stir together the oats, coconut milk, yogurt, toasted coconut, honey, chia seeds and vanilla extract until combined. 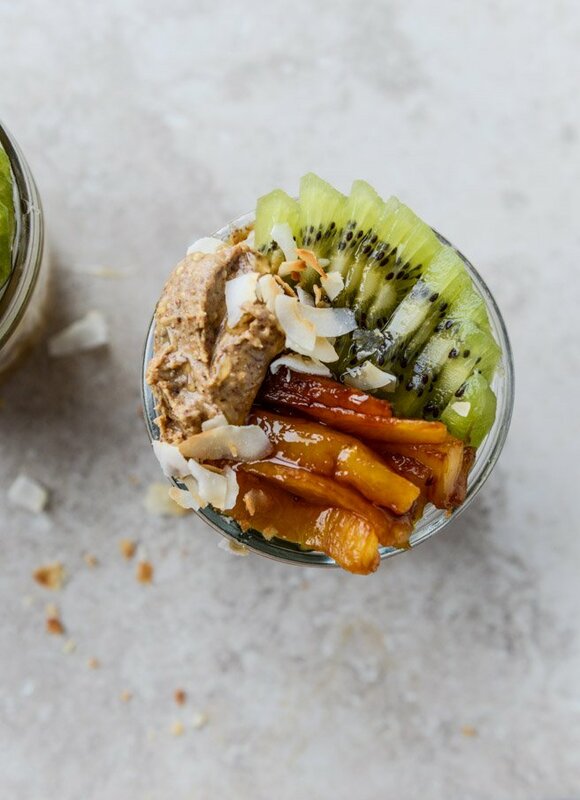 In two jars, bowls or containers, layer 1 to 2 tablespoons of almond butter into each and press it on the bottom of the jar. 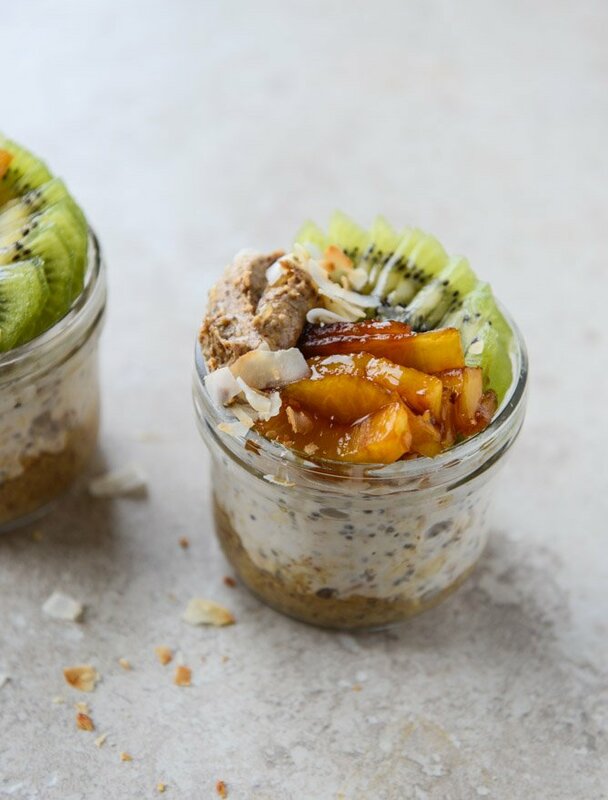 Top each with equal spoonfuls of the overnight oat mixture. 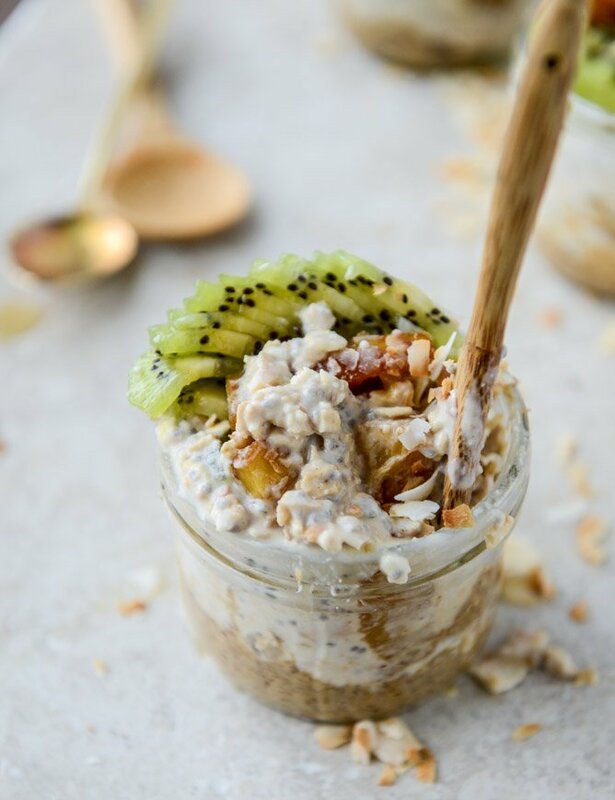 Add another tablespoon or so of the almond butter (basically, finish what you have) and top with the remaining oats. I like to top it with more toasted coconut then cover with plastic wrap and place in the fridge overnight. 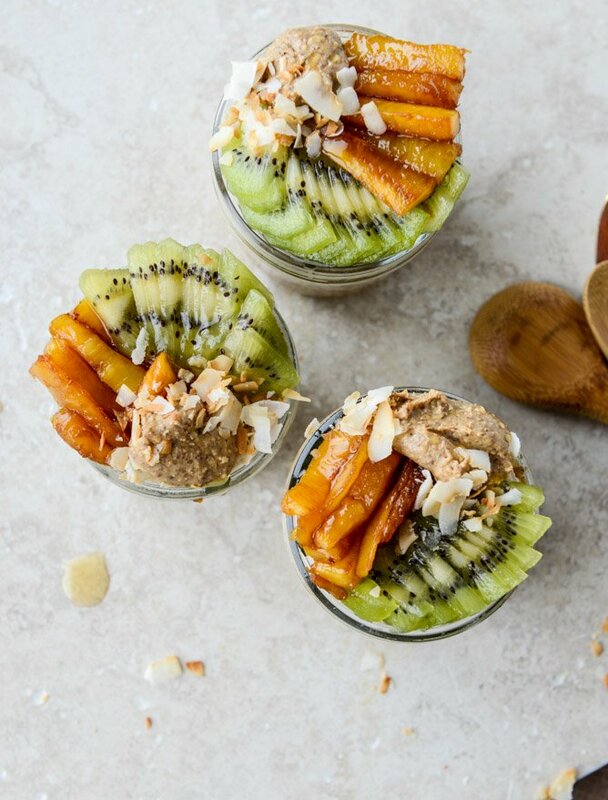 When ready to serve, top the oats with the pineapple, sliced kiwi, a bit more almond butter and toasted coconut. 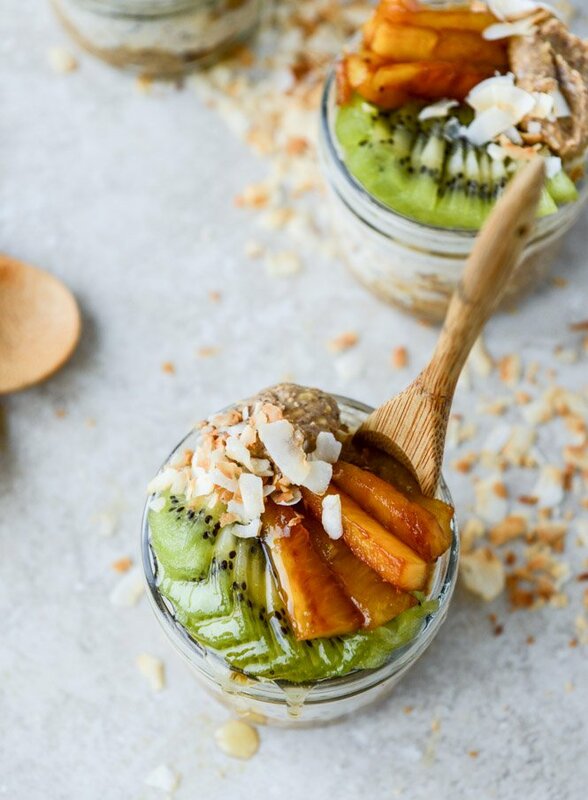 Drizzle everything with honey and go at it! Add the pineapple to a skillet over medium heat and add the honey. Cook, tossing and stirring often, until the pineapple becomes golden and caramely. another 5 star recipe! delicious! !